A close friend (the one who taught me to make potstickers) came to me with a culinary challenge. Her six year daughter is not a particularly adventurous eater, but she loves loves loves one thing: a packaged curry called Madras lentils made by a company called Tasty Bite, sold in shelf-stable pouches. You snip open the pouch, heat the curry and it is ready to eat. My friend wondered if there was a way to make this stuff at home- to avoid the packaging, and there's no doubt that making it at home would be cheaper, and with more control on how much salt, oil and spice goes into the dish. Challenge accepted. I told her we could it quite easily with some reverse engineering. I've never tasted this packaged curry myself, but a web search gave me the ingredient list- a gratifyingly short and simple one: Water, Tomatoes, Lentils, Red Beans, Onions, Cream, Salt, Butter, Sunflower Oil, Chilies, Cumin. Looking at the ingredient list, I'd guess that they cook onions and tomatoes together in some oil, season with cumin, salt and chilies, then add the paste to cooked lentils (whole masoor) and red beans (rajma or kidney beans) and add some butter and cream to finish. By the way, I'm not sure at all why these are called Madras lentils. Just sounded like a catchy name, maybe? We got together this Saturday evening and cooked it together. Since I had dried kidney beans and a pressure cooker on hand, I just soaked a cup of rajma/kidney beans overnight and cooked them with the lentils. But I'm trying to make this recipe amenable to those who are total newbies to Indian cooking, so the recipe below calls for no special equipment and for no ingredients that you couldn't find in any old supermarket. 1. Soak 1 cup dry brown lentils (sold in supermarkets as lentils and Indian stores as whole masoor) for a couple of hours (see pic above). Rinse and cook in a pot with 2 cups water until tender. Set aside. 2. Rinse 2 cans red kidney beans, drain and add to cooked lentils. 3. In a pan, heat 1 tbsp. butter + 1 tbsp. oil. 4. Saute 2 diced onions until browned. 5. Add salt to taste, 1/2 tsp. cayenne pepper (or 1 tsp. paprika for even milder version) and 1 tsp. ground cumin. 6. Add 1.5 cups canned crushed tomatoes and stir fry for 5-10 minutes. 7. Cool the mixture, then blend to a smooth paste in a food processor or blender. 8. Combine cooked lentils, beans and onion-tomato paste in a saucepan, adding some water if needed. Bring to a boil and simmer for 5 minutes. 9. Stir in 1 tbsp. butter, 2-3 tbsp. cream and serve as a stew or over steamed rice. According to my friend, our curry looked just like the real thing, except that the packaged version looks much redder. Maybe they add Kashmiri chili powder- which is mild and bright red? She was delighted that the dish was so simple to make. According to my friend's daughter, our curry was "even better than the real thing, because it is not as spicy". She approved of the knock-off version and ate two helpings. Mission accomplished! Now, to my own taste, I would have loved some ginger and garlic in this dish, and perhaps some turmeric and definitely more chili powder. But it is a great starter recipe for anyone new to tasting or cooking Indian food and most importantly, it made a kid and her mom happy, which is all I set out to do. I love those 'Madras' lentils! :-) I have to confess, I have a packet in my office for times I miss bringing lunch or crave for creamy dal makhani all of a sudden. I have it on its own in a mug like a bean chili, a 6 pack box has lasted me for more than a year now so its a rare but delicious treat for me. I agree on finding the name to be a complete mis-match, it should be called Punjabi lentils instead :-) I think the red color comes from tomato paste in addition to kashmiri chili powder. When I make it at home I can't resist adding the ingredients you said you missed even though when I am eating it from the packet I don't miss them at all - its perfect and so comforting. Your post has tempted me to give it a try again at home. Aha- tomato paste and Kashmiri chili powder- that would be good to try when I make this again! Yeah, Punjabi lentils would make more sense. I make rajma on its own and masoor on its own, and I must say the combo is quite nice. My first thought when I read about the color difference is using dehydrated, powdered tomato. I use it in place of some tomato paste in soups, stews and chili, it really makes a dish pop in color and has a slightly sweeter taste than tomato paste. I don't know if it's commercially available though, it's one thing I do with my abundance of garden tomatoes. Hi Nupur, What is the indian name (in the indian store is there a hindi name) for brown lentils? Masoor. The whole masoor (with brown skin) not the pink masoor dal. Good question- I've updated the post. The lentils that they use in the packaged 'Madras lentils' are most certainly 'whole black urad dal' and one gets them in indian grocery store...'lentils' is very generic term to define them since there are so many kinds of lentils. Whole black urad dal takes longer soaking and cooking time but turns out creamier. Aha, lightbulb moment happening here- that's what I get for not tasting the dish before replicating it :) Urad dal indeed would be much closer to the real thing. But it is not found in supermarkets so I think brown lentils do work for those who don't have access to Indian stores. I want to get the Urad dal lentils you are talking about for this recipe. I see them for sale on Amazon whole and split. Does is matter which one I buy? Well, I guess it appeals to some people and not to others, just like with any food. I have been trailing on the weight loss promise that I made on your post during the start of the year. Nevertheless things are looking up now. I hope this goes on and won't spiral down! You have always been a source of inspiration for me and hopefully I have what it takes to win the battle. Your meal posts is what stirred me and keeps me going. Thanks from the bottom of my heart. Madhavi- Every day and every meal is a chance to do something different, it is not easy but is well worth it. Good luck to you and thanks for this note! As Shakespeare says, 'What's in a name?' :) It sure looks and sounds very delicious and the kid gave it a thumbs up so that's the biggest compliment. On one of your posts, I read how you tear lettuce into bite sized pieces and store it. I followed your instructions and I'm happy to report a huge success. Not only does my lettuce much last longer in these scorching Indian summers, it also stays crisp and tastes fresh. Makes it very easy to put together a simple salad when in a rush. Thanks for that neat idea! Oh I am so glad the lettuce storing idea worked for you! Same here- if I have the lettuce torn, washed and ready to eat, I am much more likely to actually eat it. Madras lentils sounds more like the dal makhani or kali dal, the famous Punjabi lentil dish. It is amazing.. and I try and make it at home - but never get the restaurant taste mastered. And you are right, ginger garlic and green chillies make all the difference to this dal. Traditionally though it looks a dark brown / almost black colour, as against red. Enjoyed the post as always!! I must add, have been enjoying all your "healthy posts" lately, and they are helping me. Especially your suggestion in one of your earlier posts, that the occasional fancy meal, is fine. It helped me cut back on cravings by a lot - by giving in to a cheat meal once in a while. This version was a simplified knock-off one, still tasty though. Thats a fab recipe!! Thanks.. I dont think I have ever had authentic dal makhani myself.. but going to give the recipe you shared a shot! Yes, Punjabi lentils would have been way more appropriate! I can see how these packets would be convenient on hiking trips. On topic of lentils, planning to make this one one of these days. Thought you might like to check out the recipe too. We tasted this in our local Costco -- it tasted pretty good and even my picky eater liked it, but I thought it's an easy dish to make at home, so never bought it. Your version sounds easy enough for anyone to try. I'm going to make it for my family some time. My young, picky eaters also love this entrée, and I will be trying this recipe at home in the next few days. If I may interject, I believe the cream is whole, most commonly called heavy cream at American supermarkets. The original packaged dish has a hint of sweet creaminess, not a tart finish, so definitely not sour cream. Yay!!! Thank you so much. I have been buying these for years as my fit children all love them (no small feat for a food) and my husband and u like them too in a pinch. But I've hated the idea of the packaging and, of course, cost. I have searched for a post like yours several times over the years and, now, thankfully you have come along. You've made my week! I am so glad you posted this recipe, I bought a package and love them but they are too expensive to buy as often as I want to. I am very new to cooking Indian food and have no idea about spices. When you suggest ginger, do you use powdered or fresh ginger? How much turmeric and ginger would you suggest adding, just a baseline would help, like teaspoons or tablespoons? Thank you so much, your blog is wonderful and I am so glad to have found it! I finally got around to trying this recipe, with the added turmeric, ginger and garlic as suggested. So delicious! Thank you so much for the help! I don't think I have ever used more than a dash of cumin in my life before and after this recipe I think I can live off this combination of spices, can't wait to go through the rest of your blog! I'm so glad the recipe worked for you! Welcome to the wonderful world of spices and seasonings :) Feel free to e-mail me if you need help with any recipes here. I am excited to try this! I love these things and eat them just about every day mixed with quinoa. It is a great protein packed lunch for me. But they are sooooooo expensive! I'm new to cooking both Indian food and lentils in general. Do you think this recipe would freeze well? Delicious! The first time I made this, I followed the recipe exactly. It was great, however I wanted just a tiny bit more kick. Second time, I increased the cumin to 1-1/2 tsp and also added 2 Tbsp of chili powder. I'll make future batches with the added spices, but wanted to thank you SO much for putting this recipe out there! These lentils are one of my absolute favorite dishes but they're just too expensive to buy the amount I *want* at Costco. Now I can have them any time, and they're quite affordable! You are so welcome! I am glad the recipe worked for me and that you were able to tweak it to your needs! 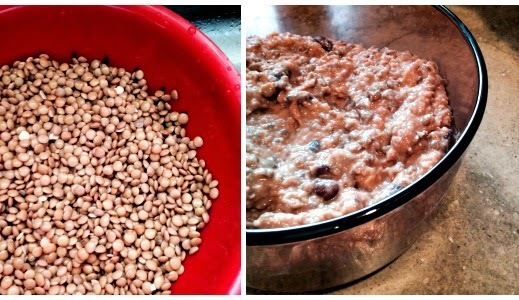 If you buy dried beans/ lentils in bulk (Indian grocery stores are good for that) this recipe is very inexpensive. The lentil/bean proportions for dal makhni should be1/2 cup of urad dal to 2 tablespoons of red kidney beans, or 3/4 cup of urad dal (little whole black lentils) to 1/4cup of beans. That is, a tablespoon of beans for each quarter cup of lentils. The packaged madras lentils follow this proportion. I did not follow your proportions exactly, but it was a great base to get me started. I was trying to use up some partial bags of lentils that had been hanging around my pantry awhile, and as I discovered when I started pulling out ingredients for this, one of them was actually split peas, but they worked out fine anyway! I added fresh minced ginger and a small can of chopped green chiles, and only used one onion. My kids love the Tasty Bite pouches, and they happily devoured this, even my super picky youngest. Thank you! Ingredients in Trader Joe's Indian Fare Madras Lentil seems to be identical to that of Tasty Bite, except the TJ's version contains ginger. Thank you for this knock-off recipe. The cream makes an amazing difference, so delicious! The ingredients in Tasty Bite is identical to Trader Joe's Madras Lentil in a packet, EXCEPT TJ's version also contains ginger. I doctored my version with canned mild green chilies and cumin. The cream is essential. So delicious!